Lough Boora Parklands, a beautiful new landscape at the heart of Ireland, offers a unique visitor experience. A range of activities ensures that there is something for every visitor. Roam the walkways and meadows and engage with this extraordinary landscape. Relax in a peaceful, natural environment. Interact with art and nature in one location or use it as a place to take some exercise. Pursue your favourite hobby (cycling, angling, birdwatching, photography) or use it as an educational resource. 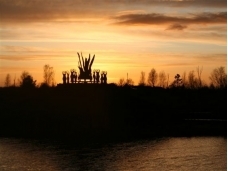 After an energetic walk or cycle or if you have simply been exploring the sculptures or observing the plentiful flora and fauna, why not complete your visit to Lough Boora Parklands with a picnic? Facilities including picnic benches, restrooms and parking are on site. Bringing your own picnic allows you to extend your visit to Lough Boora, giving you more time to discover the many features in the parklands. History:Birr Castle is the oldest inhabited home in the county. In the 16th century the O’Carrolls of Ely had one of their castles here and this was granted to Sir Laurence Parsons about 1620. Sir Laurence Parsons built most of the structure of the present castle. 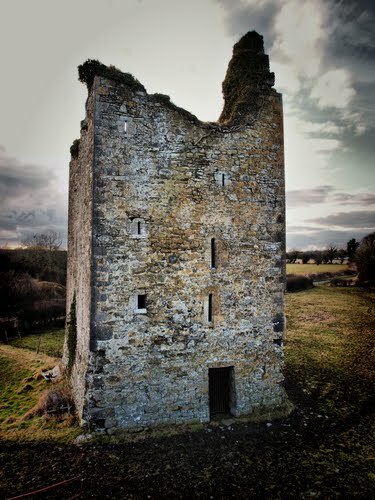 The castle was twice besieged in the 17th century and one of the towers still shows the scars of the artillery of Patrick Sarsfield, who tried unsuccessfully to take it. 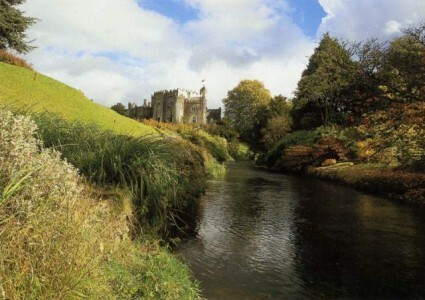 The castle still remains the seat of the Earls of Rosse and is home to the seventh Earl (Brendan Parsons) at present. As a family home, the Castle is only open to the public on special occasions. The surrounding demesne however is open to tourists every day of the year, and the gardens contain many fine trees and shrubs set in a landscaped park with waterfalls, river and lake. 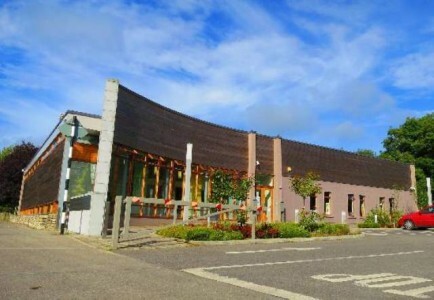 Athlone Castle Visitor Centre is a major tourist attraction in the town of Athlone and features both the Castle Visitor Centre and the new Luan Art Gallery. The castle is of Norman origin and dominates the town centre of Athlone, County Westmeath. It commands the traditional gateway to the west of Ireland. The first real signs of settlement at Athlone grew up in Anglo Norman times around the castle, which was built for King John of England by his Irish justiciar Bishop John De Gray of Norwich. Though not the first castle to be built at Athlone, this castle has endured like no other. 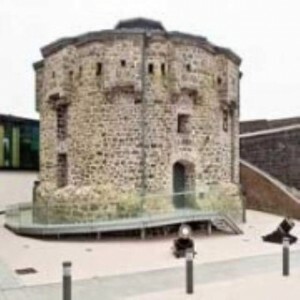 Looking at it today it still incorporates elements of the castle of 1210, together with various additions and alterations which were made in response to advances in warfare. It has many of the characteristics of a Napoleonic fortification as it was remodeled during that period to defend the crossing point of the Shannon. Today the castle still dominates the west town of Athlone perched on the River Shannon. Following recent renovations the castle now boasts eight new spaces that offer the visitor a hands on interactive experience and explores the rich history of the town. Visitors to Athlone Castle will explore Early Settlement, Athlone Castle’s first 400 years, Pre-Siege, Siege 360, People of the Siege, Fabric of Athlone, Self-Sufficient People and Death and Destruction. Kinnitty Castle Hotel, located in the picturesque village of Kinnitty County Offaly, situated in the foothills of the Slieve Bloom Mountains, offers the perfect setting for a relaxing break away. Arrive up the winding avenue, opening into breathtaking views of the 13th Century castle seated on 650 acres of parkland, inclusive of 60 acres of rolling lawns. Enter the lavish Medieval revival castle, drenched in original features, heritage colours and regal atmospheres dating back to 1209. Wander through the fine settings of the Library Bar, The Sli Dala Restaurant and the drawing room, all with magnificent character. Relax beside the unique open fires, enjoy the best of local cuisine prepared by the executive chef, Anthony Holland. Rest in the opulence of the 37 distinctively styled guest bedrooms take in the high ceilings, cast iron roll top baths and original features in keeping with the period of the property. 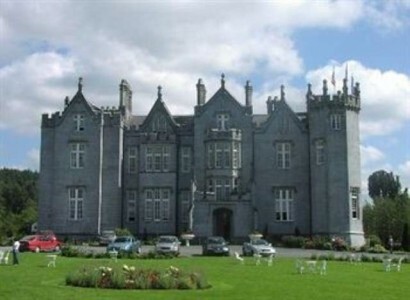 Kinnitty Castle Hotel, a little piece of Irish magic in the heart of the midlands. 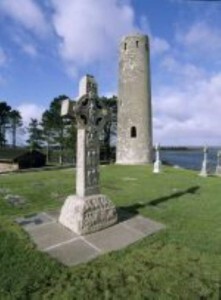 Clonmacnoise is situated on the banks of the river Shannon, once a strategic point of embarkation for chieftains who would leave their boats and travel inland to Hill of Tara seat of the ancient High Kings of Ireland. Saint Ciaran founded a monastery here in 6th century which then became a place of reverence and excellence in learning that typifies that period in Irish history, when Ireland was known as the Land of Saints and Scholars. Highly skilled, the monks created illuminated manuscripts like the Book of Kells and intricately elaborate metalwork crosiers and chalices such as the Ardagh Chalice that were inlaid with precious stones. The Vikings targeted these settlements when they arrived at the end of the 9th century which led to the building of the round towers. Notice the doorway is high up, the idea being, that the monks could escape up there with their treasures and pull up the ladder behind them. The site today consists of two round towers, a cathedral, seven ruined churches, three high crosses, and a heli-pad? Clara Bog is one of the best remaining examples of a relatively intact raised bog in Western Europe. It has been said that you can experience ten thousand years of history in the ten square kilometres that accommodate Clara Bog and its surroundings. Clara Bog is a naturally wet environment with many concealed dangers such as deep pools and quaking surfaces. As with any outdoor activity, dress appropriately. Please leave Clara Bog exactly as you would wish to find it. The nature reserve is home to many protected wildlife species. It is an offence to disturb these wild plants and animals. Clara Bog Visitor Centre & Nature Reserve boardwalk which meanders through Clara Bog Nature Reserve, is located a two minute drive from the Clara Bog Visitor Centre. The boardwalk is a 1 kilometre looped walk on Clara Bog. It will enable visitors to see the many wonderful plants, birds and animals which Clara Bog is home to and soak up the atmosphere of an exceptional raised bog in the heart of Ireland. Admission to both Clara Bog Visitor Centre and the boardwalk are free to all. Visitors to the boardwalk are recommended to wear sturdy footwear. If you would like a guided tour of Clara Bog, contact the Clara Bog Visitor Centre. Sir John MaCoghlan built Coole Castle on the banks of the Brosna in 1575. It was the last of the MacCoghlan castles to be built. He erected it as a present to his second wife Sabina O’Dallachain. Formerly there was a mural slab in the castle with a Latin inscription translated in English as ““This tower was built by the energy of Sir John MacCoghlan, K.T. chief of this Sept at the proper cost of Sabina O’Dallachain on the condition that she should have it for her lifetime and afterwards each of her sons according to their seniority”. Gallen Priory Cross Co. Offaly, Ireland. Half a mile south of Ferbane, Ireland is the site of a 5th century priory with a collection of 8th to 11th century grave slabs preserved in the modern priory. Close by is the River Shannon, the longest river in Ireland, bounds the western edge of Co. Offaly. First settled almost 9000 years ago, West Offaly is rich in prehistoric treasures. 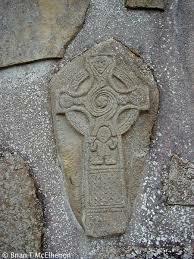 The Gallen Priory cross is the gravestone of a monk. Four serpents, whose tails wind into a spiral, appear to be attacking the human heads. The person on the shaft appears to be struggling with the serpent or dragon. The head, long considered the seat of thought and of consciousness, struggling with temptation, suggesting the inner struggle of the soul as it strives after the Christian ideal.